Ohio University’s Edwards Accelerator Laboratory sits tucked away within the walls of an unobtrusive brick building that extends some way into the hillside at the center of the main campus. This facility blends in with surrounding buildings, yet it attracts researchers from some of the most prestigious institutions across the country and around the world. The laboratory is managed through the Physics & Astronomy Departmentand is a part of the Institute for Nuclear and Particle Physics. 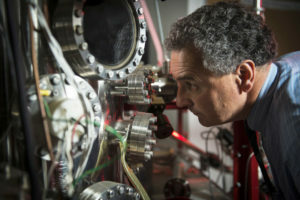 Although this accelerator has traditionally been used for the study of nuclear reactions, Physics & Astronomy Professor and Chair and Nanoscale and Quantum Phenomena Institute member Dr. David Ingram said the accelerator has numerous applications for material science, including analysis of electronic materials and archaeological samples. For example, the accelerator recently was used to characterize samples of coal-derived graphene films with Chemical & Biomolecular Engineering Distinguished Professor and NQPI member Dr. Gerri Botte. Ingram partners with numerous OHIO faculty, including many NQPI members – Arthur Smith, Saw-Wai Hla, Martin Kordesch, Jason Trembly, Wojciech Jadwisienczak – and their students, as well as researchers from across the country. The accelerator functions through a high-voltage power supply that propels particles at high speeds within a concentrated beam. This technique allows researchers to characterize properties of targets including atomic composition, nuclear energy levels and resistance to radiation damage. Because OHIO’s accelerator produces a greater current than most other accelerators, it can be used in a broad range of applications. These working conditions can help mitigate the effects of background noise in analysis of data. In addition, the accelerator is housed in a well-shielded building that minimizes background radiation. The facility has been maintained entirely by OHIO staff and faculty since its induction in 1971. Ingram credited the facility’s success to its late founder, Roger Finlay, noting that OHIO’s accelerator has remained a viable asset due to its unique capacity to produce a remarkably high current. This article first appeared in the Nanoscale and Quantum Phenomena Institute Spring 2018 Newsletter #19.